Toss out the video games and television shows because a tornado of educational toys just arrived! From magnetic card sets to puzzles, there are hundreds of toys and tools to get your child’s mind gears going. With numerous toys and tools to choose from to better your child’s mind development, we’ve chosen the top 10 best educational toys for them to play with and learn from. Not only will your child learn about colors, numbers, and basic concepts, but they’ll also discover the eternal desire to learn and question the life around them. By combining toys and education in one, children will never know that they’re learning! Make education fun for your kid with any of the handmade, eco-friendly items listed below. Before you know it, they’ll be the top student in their class! You can use educational toys and games before school starts for your child, or even during the school year to give them a boost in their school learning. Although centered around parents giving any of these educational toys to their children, the toys listed can be a great tool for teachers as well. Based on Montessori concepts, Apple n’ Amos presents a Teach Me System that provides aid in children’s motor skill development, reading skills, spelling skills, and more. With acorns, small blocks of words, various shapes, and many more in this toy kit, kids can have endless fun and learning. From matching to colors, your child will be able to learn various, basic concepts to build their foundation for lifelong learning. Wooden shapes and word blocks are put into a muslin bag, making this Teach Me System a portable educational toy for long rides. 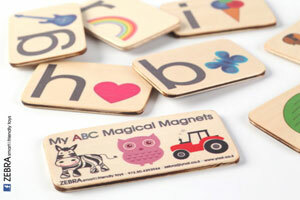 Decorate your fridge with ZEBRA’s ABC alphabet card magnet set! Each alphabet card has a letter and image associated with that letter, which provides even more learning aid for your child. Perfect for pre-k and kindergarten students, help them practice their ABCs with this fun and child-friendly ABC magnetic card set. Get the whole family to participate in your young child’s problem-solving skill development with Tinocchio’s matchstick puzzle set! 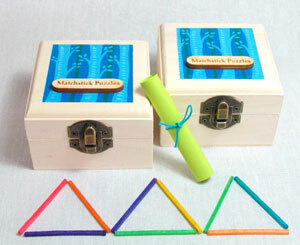 Matches and puzzle sheets are placed in embellished wooden boxes for safekeeping. Tinocchio colors its matchsticks with lead-free paint, which makes this puzzle set eco-friendly as well as entertaining. Get creative and make up your own matchstick puzzles with Tinocchio matchstick puzzle set for your child to solve! Develop your child’s motor skills and creativity and indulge their curiosities with Wilderness Serenity’s wood sewing toy kit! 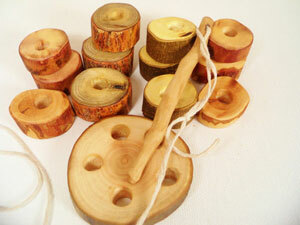 Each wood sewing kit includes 12 various sized wood rounds, a lacing wood piece, cotton thread, and a wooden needle. Made with organic ingredients and salvaged trees, Wilderness Serenity’s wood sewing toy set provides a safe play kit for kids. 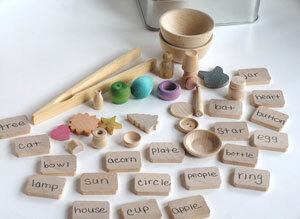 Teach your child how to match and sort by color with Indie Bambinos’ wooden, Waldorf-inspired acorn sorting set! With color coordinated acorns and miniature bowls, your kid can learn how to match and organize acorns with bowls by color. Bright rainbow colors are used to help your child differentiate each color easily. 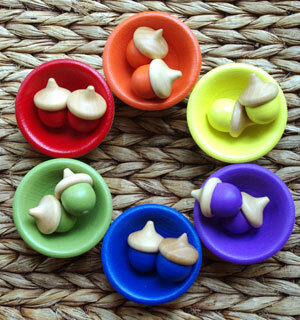 In this set, you’ll receive 12 large and painted acorns in a muslin bag along with six bowls. Sealed with non-toxic Shellac and all natural beeswax and extra-virgin olive oil, this bowl and acorn toy kit can be used for many years due to its durable finish. 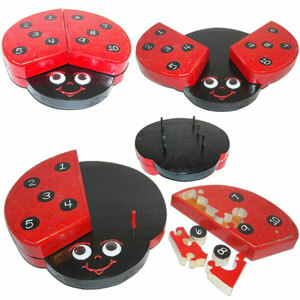 Combine teaching puzzle-solving skills and numbers with The Puzzled One’s 3D ladybug number puzzle! The Puzzled One’s counting ladybug 3D puzzle allows your child to separate the wings from the main body and dump out the puzzle pieces to put the puzzle back again. With 28 puzzle pieces, 18 of the pieces are regular ones and the other 10 are circle-shaped puzzle pieces with numbers on them, which can help your child discover numerical order and learn counting. The Puzzled One provides sealant options to help keep your learning youngster’s ladybug puzzle in tiptop shape. 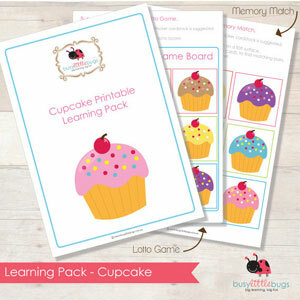 Add a sweet touch to learning with Busy Little Bugs’ cupcake learning pack! From sequencing to spotting the difference, there are various learning activities and games in this pack for your children to do. As a downloadable PDF document, you’re able to print as many as you like for your kids. Rules for each activity and game are on each sheet of the learning pack. 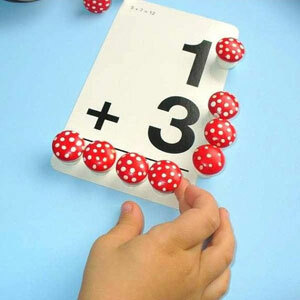 Make math flashcards easier to do with The Enchanted Cupboard’s little counting mushrooms set! These adorable and quirky mini mushrooms are painted with red and white polka dots for a fairy-like appearance, which doubles as props for fairy dollhouse adventures. Use The Enchanted Cupboard’s counting mushrooms set for various games and activities to teach your child basic counting and math skills. You can even use the polka dots on the mushrooms in your mathematical skill development games! Let your little ones put their own worlds together with Aly Parrott’s continent geography puzzle! 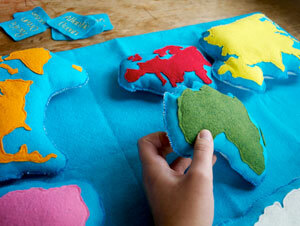 Formed with quality felt wool in various colors, this continent puzzle allows your child to memorize the major continents of the world, such as Asia and Australia. Included with this game are the tags for the oceans of the world as well so that your child can have a full learning experience. Keep this continent game from Aly Parrott safe and sound in a given muslin bag. Learn to tell time and how to match with Laughing Crickets’ matching clock game! Based on 2’’ wooden discs, numerical and analog times and images are recorded to aid in honing time-telling and memory skills. You can either show your child to match times with all images facing up or put all image faces down and play a matching memory game. 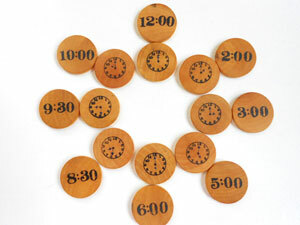 Carry this matching clock game along on family vacations easily in the given drawstring pouch from Laughing Crickets! Use your imagination to find other ways to use educational toys for your own games and activities with your children besides their original purposes. Teach your children that learning involves creativity and can be molded into countless ways to help them add to their knowledge and improve their brain power.